At Eaton County, MI, accounts payable (AP) is a process that touches all 25 departments. With approximately 1,000 invoices processed per week county-wide, AP used to be a very paper-heavy and cumbersome process. 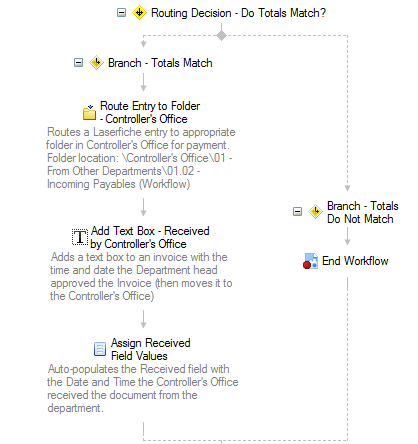 Here is how we have automated it with Laserfiche Workflow. Looks up the vendor number in our New World Systems – LOGOS Financial System and retrieves the vendor name to populate the “Vendor Name” field. If there is no vendor name in the database associated with the vendor number, the document is renamed “_INVALID VENDOR NUMBER”. Calculates the “Purge Date” by adding seven years to the invoice date retrieved from the template. Since we like to purge all our documents at the end of the year, the date is formatted to be “12/31/YYYY” with YYYY corresponding to the calculated year. 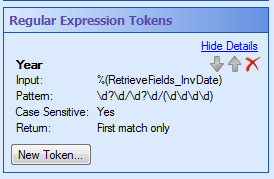 Converts the data from the template fields into tokens. Uses the “Pattern Matching” activity to extract the dollar amount from the “GL Code” multi-value field and adds them together with a “Token Calculator” activity. It then inserts this total into a brand new token. Workflow then compares this calculated total to the “GL Distribution Total” (the amount entered into the template by the user). If the totals match, the department head is notified by e-mail that he has a new invoice to review. 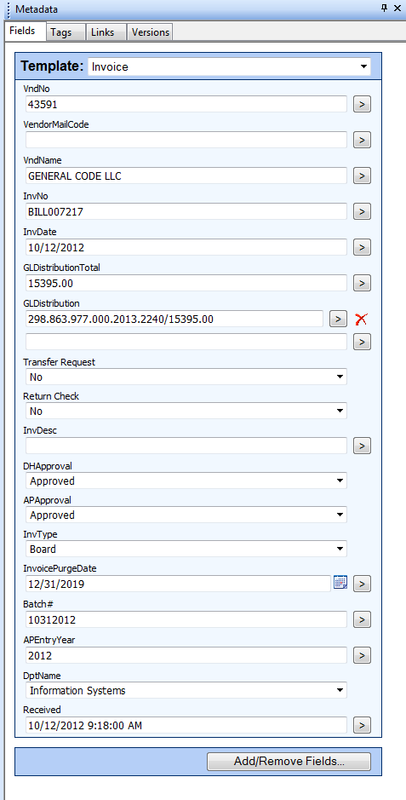 If the totals do not match, the invoice is renamed “_TOTALS DO NOT MATCH” and the workflow terminates. Once this field value is updated, the “Department Approval” workflow is invoked. This workflow reads the value of the “DH Approval” field and performs different actions based on it. The invoice is routed to the “Incoming Payables (Workflow) folder in the Controller’s Office for review. A text box is also appended to the document with the time and date that the department head approved the invoice. If the condition is false, the workflow terminates. If the department head denies the invoice, the “DH Approval” field is cleared out and an e-mail is sent to the specific department asking them to review and re-submit the invoice. 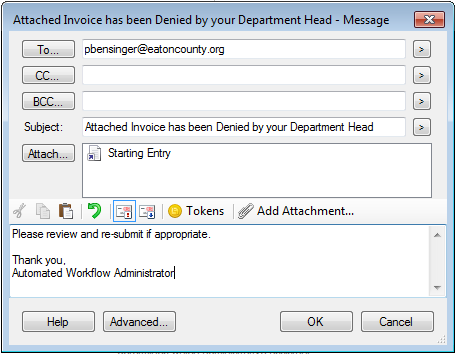 If the department head selects the “Controller” as a result of their review, the entry is routed directly to the controller’s folder and an e-mail is generated asking the controller to approve the invoice. In some instances, money needs to be transferred in order to pay for the transaction. In cases like these, the invoice will have the “Transfer Request” field set to “Yes.” Since this field is only used by Information Technology, field security is configured to hide this field from users in all other departments. Another workflow checks for this field value and sends an e-mail to the controller asking for a budget transfer if one is needed. After the controller reviews the invoice, he can either approve or deny it by updating the value of the “AP Approval” field. 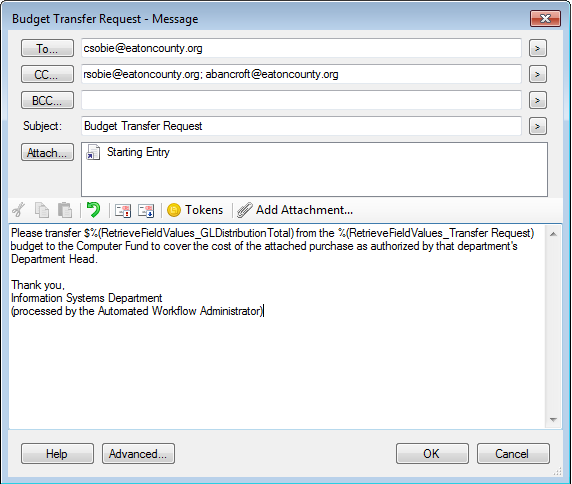 A textbox is added to the invoice listing all the GL Distribution Codes and amounts that are pulled from the invoice template. The year is extracted from the invoice date using the “Pattern Matching” activity. This allows us to sort the invoices by year in their final storage location. An AP assistant enters the invoice into our Accounting System and generates a batch number which she then enters into the “Batch #” field. She also populates the “APEntryYear” field, which causes the invoice to be routed to its final archival place in the “County Financials” folder. If the invoice was denied, it is routed to the departmental folder and an e-mail is sent to the department head asking for the invoice to be reviewed, completed and re-submitted. The “AP Approval” field is then cleared out. 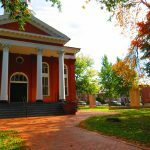 Approved invoices remain in the County Financials folder for seven years until they are purged by the Records Manager. In order to make sure that all invoices are reviewed and approved in a timely matter, we have scheduled a special workflow to run on Thursdays at 9:30 am. 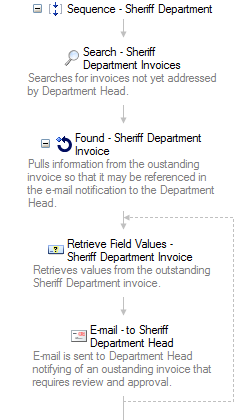 This workflow searches the repository for invoices that haven’t yet been addressed by the department head and, when appropriate, e-mails the department head with a reminder that there are outstanding invoices. 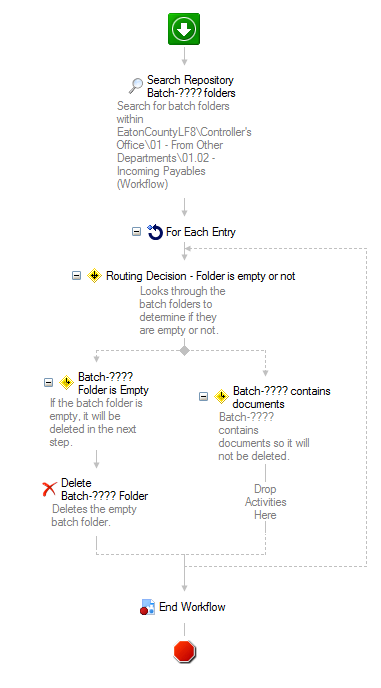 In order to keep the repository clean and organized, we have another scheduled workflow that runs daily at 9 pm to check for any empty batch folders (the folders created during the AP process described above) and deletes them. The best way to learn is from others. 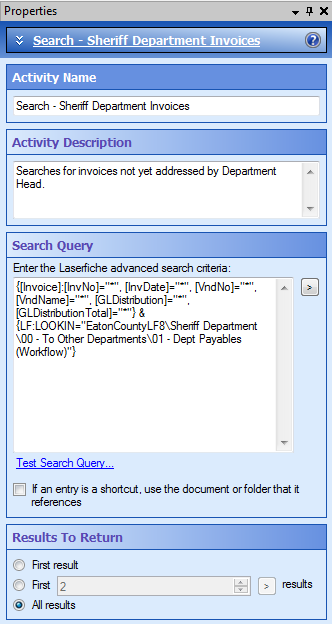 Take advantage of the numerous resources out there including the Laserfiche Support Site and regional/local user groups. Break your large workflow into smaller, individual workflows corresponding to each of the main parts of your business process. Generate buy-in from other departments by demonstrating the new workflow can make their working lives a lot easier. Get more advice for automating accounts payable with the free guide: 5 Steps to Accounts Payable Automation.